Warm Mediterranean hospitality is the cornerstone of the Brandonisio family’s success and it’s the thing you’ll find aplenty at this scenic winery, restaurant and guest house in Maple Park. 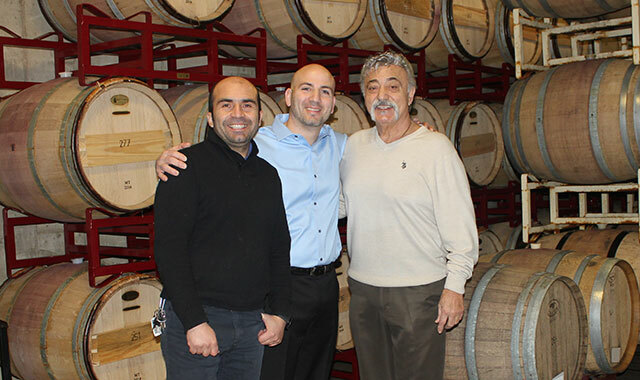 Head winemaker Sergio Benavides (left) with general manager Joseph Brandonisio and his father, owner Vito Brandonisio, inside the cask room. For thousands of years, grapes have been cultivated as a source for fine wines. Grapes are widely recognized as the largest food crop in the world, with more than 10,000 varieties. Still, few of the world’s vineyards are as treasured or as celebrated as those in Italy. That’s one reason why Acquaviva Winery, 47W614 Illinois Route 38, in Maple Park, has swiftly become a destination for those who appreciate fine wine coupled with the world-famous hospitality for which Italy is known. Located just 50 miles west of Chicago, Acquaviva has achieved regional recognition in less than a decade based not only on its selection of delectable wines but also its warm hospitality. When the family purchased 40 acres of land in Maple Park to build a new family home, they saw prime terrain underfoot. “We looked at the soil here, which is sandy and rocky, and thought we might be able to grow our own grapes for wine,” Joseph Brandonisio says. The family began with 3 acres of select hybrids that could withstand the tremendous variance in Midwest temperatures and precipitation. The winery quickly grew to 6 acres and then to 20. In 2000, the family purchased land across Route 38 and expanded their vineyard to include more hybrid varieties. The structure that houses the winery operation, tasting room and restaurant is an impressive stone-covered structure with a distinct echo of Italy. The building’s lower production area holds more than 300 barrels of wine in various stages of production. But underlying the architectural beauty and pastoral appeal of the winery, Brandonisio believes operating a successful winery is both an agricultural and commercial challenge. To help the operation successfully cultivate wine grapes and produce fine wine, Acquaviva brought in head winemaker Sergio Benavides, a native of Chile who’s worked with vineyards in Spain and California. Benavides, who arrived in 2010, heads up not only the vineyards but also the entire vinification process that produces more than 23 fine varietals. Among the distinctive wines visitors can savor and serve are Acquaviva’s own Sangria and the full-bodied Don Giuseppe, an Italian red. For the more adventurous wine enthusiast, Acquaviva has crafted a Frontenac delicately flavored with black cherry and toasted vanilla. The Donna Mia is a crisp white wine with a hint of citrus. In a salute to the Midwest, Prairie Star offers tasters a lightly sweet wine touched with tangerine. When the year’s harvest falls short of their goals, Brandonisio sources grapes and juice from outside growers. Early on, Acquaviva began offering small plates of Italian specialties paired with its wines. The food was so appreciated by visitors that it inspired Brandonisio to open a full-service restaurant on-site. Fans of Acquaviva can also enjoy the family’s cuisine and wines at the Ristorante Di Acquaviva, 219 W. State St., in Sycamore, and the Acquaviva Winebar, 214 W. Main St., in St. Charles. The Maple Park restaurant boasts extra space that’s ideal for gatherings, celebrations and parties, so it was only natural when Acquaviva began receiving requests to host weddings. Couples can celebrate both their ceremony and reception on the Acquaviva grounds, which can accommodate nearly 230 guests for such an event. The business expects exciting growth over the next few years. Brandonisio is planning another expansion that will bring 400 new hybrid vines on an additional 10 acres. A cozy guest house is currently under construction. Once complete, it’ll bring six private suites, all furnished, with views of the vineyard estate. Families that celebrate a wedding at Acquaviva can rent single rooms or the whole house. “Guests will be able to stay and spend time looking out over the vineyards and enjoying our hospitality even more,” says Brandonisio. For those who hunger for the lush cuisine and flavorful wines of Italy, Acquaviva Winery is one way to satisfy that hunger close to home. This entry was posted on Wednesday, February 15th, 2017 at 11:57 am	and is filed under Northwest Business Magazine. You can follow any responses to this entry through the RSS 2.0 feed. Both comments and pings are currently closed.